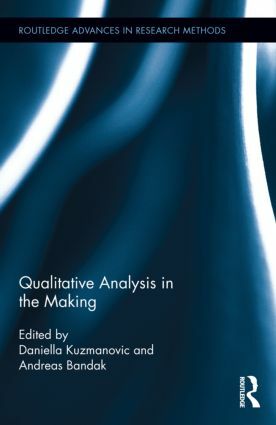 How do scholars transform qualitative data into analysis? What does making analysis imply? What happens in the space in-between data and finalized analysis is notoriously difficult to talk about. In other parts of the research process, scholars and students are aided by method books that describe the technicalities of generating, processing and sorting through data, handbooks that teach academic writing, and scholarly works that offer meta-level, theoretical perspectives. Yet the path from qualitative data to analysis remains ‘a black box.’ Qualitative Analysis in the Making ventures into this black box. The volume provides a means of speaking about how analyses emerge in the Humanities. Contributors from disciplines such as anthropology, history, and sociology of religion all employ an analytical double take. They revisit one of their analyses, analyzing how this particular analysis came into being. Such analyses of an analysis are neither confessions nor step-by-step recounts of what happened. Rather, the volume argues that speaking of the space in-between requires analytical displacement, and the employment of fresh analytical takes. This approach contributes to demystifying the path from qualitative data to finalized analysis. It invites novel epistemological reflections among scholars, and assists students in improving their analytical skills. Daniella Kuzmanovic is assistant professor at the Section for Turkish studies, Institute for Cross Cultural and Regional Studies, Faculty of the Humanities, University of Copenhagen, Denmark. Andreas Bandak is a PhD fellow at the Section for Comparative Cultural Studies, Institute for Cross Cultural and Regional Studies, Faculty of the Humanities, University of Copenhagen, Denmark, and is currently also Visiting Research Student at Department of Anthropology, London School of Economics.